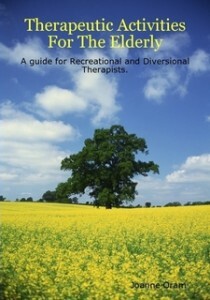 Category "Books on leading activity and exercise in Nursing Homes"
A guide for Recreational and Diversional Therapists including a comprehensive A – Z list of 150 activity ideas, bingo/housie call outs list, quizzes, word games and a whole lot more. For activity and care staff engaged in developing an active care home. Obtainable from Age UK and NAPA.